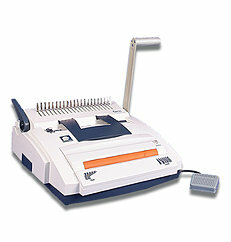 The Sircle CC-320 Combo Punch and Bind for Comb and Coil is ideal for office and school environments. This dual function binding machine offers the user flexibility in binding as it is designed to accommodate both plastic comb and coil binding. Bind your professional presentations documents in a snap with a punching capacity of up to 12 sheets for coil binding and 20 sheets for plastic comb binding. The CC-320 features an electric coil insertion of up to ½” which is equivalent of up to 130 sheets of paper for electric coil binding, and binds up to 425 sheets of paper for comb binding. The vertical punch throat provides easy paper alignment and size margin control allows for perfectly centered document punches every time. The CC-320 is an optimal hole punching machine for strong bound documents. If you have any questions or are interested in purchasing the Sircle CC-320 Combo Punch and Bind, visit us at SpiralBinding.com. We have great pricing on a full line of Plastic Comb Binding Machine. Call us at 1-800-631-3572 for more information!